Gabe Newell’s image has shown up in plenty of unlikely places over the years. Until now, my favourite version was Papal Gabe, a meme that dressed the Valve CEO up as the Pope, glowing with holy light. Today, however, Papal Gabe has given way to a new, much improved, use of Newell’s likeness. Earlier today, an image appeared on the PC Master Race subreddit, depicting a pack of men’s underwear in what appears to be a Chinese department store. By itself, that might not be notable, but the model that the manufacturer has chosen to use is none other than Gabe Newell himself. Ok, I don’t think that it’s Newell’s body, but the face on that somewhat figure is undoubtedly that of the Valve CEO. 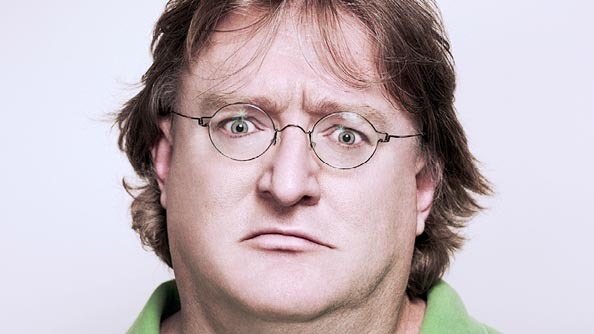 In fact, it’s so obviously him that a Google image search for Gabe Newell turns up that picture as the second result. From there, a quick (and not particularly good) photoshop job was all that was needed to turn the famous developer into an unofficial underwear model. Under that original Reddit thread, some commenters have pointed out the fact that the box contains two pairs of underwear, suggesting that it’s further evidence that Valve either cannot or will not count to three. Others have made reference to the term ‘LongD’, which can be seen in the top right of the packaging, but I can’t imagine what they mean by that. I’ve taken a look around the internet to see if I can find any evidence of this product anywhere else, but it’s slim pickings so far. I’ve come up with some textile companies whose names appear to match up with the English text on the box, but nothing official so far. The veracity of the whole thing does need to be called into question, but I’ve seen two different versions of this image already today, so I’m willing to give it the benefit of the doubt for now. I’ve reached out to Valve to see if they have any comment on the situation, and I will of course update this story as soon as I hear back.